The allegory of the cave documents a conversation between Plato’s brother Glaucon and Socrates, in which his mentor summarises the human condition with a simple analogy. The prisoners are forced, by their restraints, to maintain their observation of the shadows dancing before them. Having never turned around or left the cave, the prisoners are bound by their circumstances, believing the shadows before them to be a real representation of the world. They follow dance in the darkness as if it were the objective truth. Suppose, suggests Plato, that one of the prisoners is released and turns to face the fire, encountering the truth of his situation – that the fire was merely casting an elaborate illusion. At first, he would naturally struggle to see, painfully blinded by the light. But suppose, despite his discomfort and anger, that he was forcibly removed from the cave into the sunlight. Although he would yearn for his familiar sanctuary, over time, his eyes would adjust to the light. He would see reflections in the water, people around him, and finally look upon the sun, seeing reality in all of its unfiltered beauty. Knowing that he was now seeing the objective truth, Plato suggests that the man might return to the cave to free his fellow prisoners and help them too, see the light. However, with eyes now unaccustomed to darkness, he would struggle to find his back to the soules in the cave. His brothers, upon witnessing his blindness, would infer that he had been harmed after escaping and resist all suggestion to embark upon the journey. So, what exactly did Socrates seek to impart with this allegory? 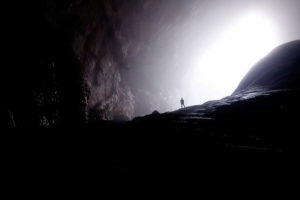 In the story, Socrates presents the cave as a superficial reality and the shadows on the cave wall as its subjective fiction. The real world that the man glimpsed, Plato suggests, wasn’t actually the experiential, material world, but the world of ideas, or the greatest good; life beyond illusion. And the shackles? A representation of human ignorance and an indication that much of humanity is trapped within its own shadow reality, blissfully unaware of its predicament. This story contains the seed of a powerful message concerning a pervasive societal affliction of mind over meaning. While I acknowledge Plato’s suggestion that the objective truth is one of forms or ideas, I prefer to apply a different meaning to life beyond the cave. My own interpretation is that, rather than another layer of thought obscuring our lives, conscious awareness is the mental state which allows us to glimpse reality. As such, from a mindfulness perspective, the story can have profound implications. You see, many of us are unknowingly trapped, imprisoned in our self-created caves. Shackled in our minds like the characters of the story, we’re prisoners to the incessant thoughts that hold us hostage. We’re forced to watch this mental fantasy like shadows dancing across the wall, consumed by its content. In fact, we become so absorbed by the fiction that we often mistake it for the objective truth. I mean, how many times have you been dragged around by your thoughts unknowingly? Perhaps you frequently replay your comments in social situations, worried that you’ve made an unrecoverable faux pas. Before you know it, you’ve catastrophised the fantasy further by deciding that everyone now hates you. The fact is, our thoughts can be incredibly mesmerising, drawing us into their narrative and convincing us that they’re grounded in fact. Which only serves to perpetuate our negative thought cycle. So how can use Plato’s allegory of the cave to break free from our bonds? Like the shackles, many of us are unwilling to relinquish our thoughts, clinging to them as if they were prized treasures. But luckily there’s a solution, and it’s called meditation. By using mindfulness meditation to simply pay attention to the present moment, we can cut through the shadows, dispel our illusions and attain a better understanding of reality. All it takes is gaining enough psychological distance to observe our mental machinations, by focusing on our moment to moment experiences. By paying attention to whatever is arising in the present moment, we’re able to simply observe our thoughts as the fantasy they are. We can finally escape our cave and see reality in all its juicy goodness.